Mortdecai is a new action comedy movie directed by David Koepp and adapted from the same named series of comic thriller novels written by English author Kyril Bonfiglioli. Johnny Depp stars in the title role alongside a supporting cast that includes Gwyneth Paltrow (aka. Pepper Potts) and Ewan McGregor (aka. Obi-Wan Kenobi) as well as Paul Bettany, Olivia Munn and Jeff Goldblum. I am a huge fan of Johnny Depp, in fact he is probably one of my five favorite actors of all time. I absolutely love most of the work he did in the 1990s including Edward Scissorhands, What’s Eating Gilbert Grape and Sleepy Hollow. But my favorite character of his has got to be Captain Jack Sparrow, an absolute icon of my childhood. With that being said, I was looking forward to this movie, if for nothing more than his star power. In the end, Johnny Depp delivered as expected and Mortdecai was a decently entertaining film largely due to his performance alone. In this movie, Johnny Depp portrays Charlie Mortdecai, an eccentric British art dealer and entrepreneur. The story centers around him and his search for a stolen painting that contains a code leading to a long lost bank account. However, he is not the only one looking for this painting as he is also pursued by a group of angry Russians, Britain’s MI5 and an international terrorist. 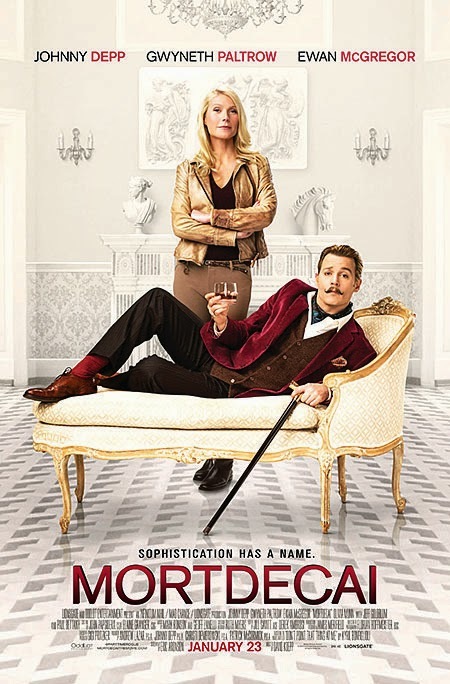 Helped only by his wife Johanna (Paltrow) and his faithful man servant Jock Strapp (Bettany), Mortdecai must use his charm and wit in order to ensure that he is the first one to find and recover this coveted painting. Overall, I had a pretty good time watching Mortdecai. I mean, anytime you have Johnny Depp acting like his usual self, you are practically guaranteed some quality amusement. The character of Mortdecai and everything he embodies was a perfect casting for Depp and I couldn't imagine anybody else playing in the role. Depp turned in another solid performance being clever and funny as ever; he was the clear driving force of the film. However, I can’t say that this movie was anything better than mediocre outside of his performance. Everything else about this film from the rest of the acting to the plot and storyline was just okay. Luckily, the last act of the movie was the best part and Depp did enough to make Mortdecai pretty entertaining.